For us, a small -- very small -- bowl of pancit canton. It seems like we've discovered another family favourite. 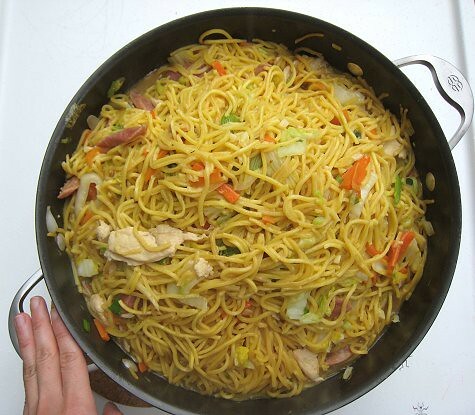 I never knew how much people liked Pancit Canton until I made one big batch for a gathering we had some time ago. Big as the batch was, there were no leftovers at the end of the night. I approached the task of cooking pancit canton with some trepidation. 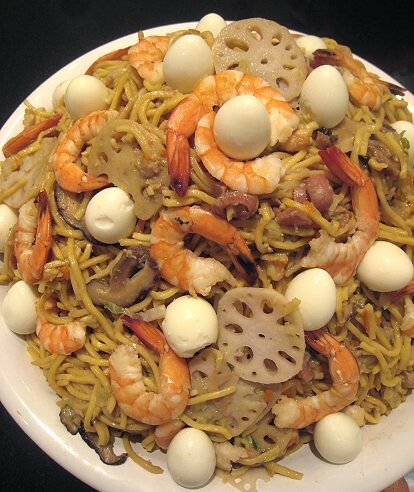 Pancit canton was a staple of birthday parties we attended from our long-gone and mostly-forgotten childhoods, where it was always served with neon-pink quail eggs. There were always not enough neon-pink quail eggs, since I remember vaguely having to duke it out with other eager and greedy kids. 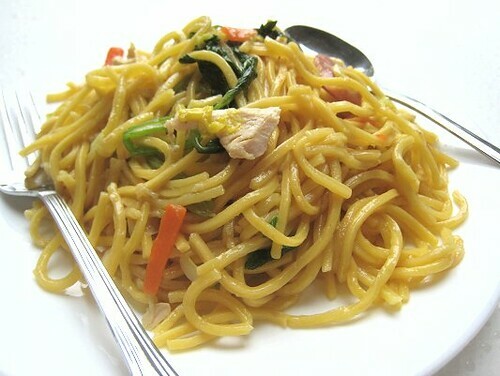 As with most Chinese noodle dishes, to which this dish alludes to (hence, "canton"), pancit canton is a hodgepodge of meat, seafood, and vegetables. For the meat, I usually use a combination of chicken and Chinese sausages. If I have shrimp, I add shrimp. If I have quail eggs, I add quail eggs. 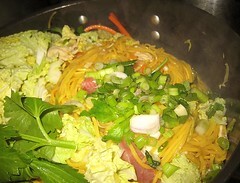 For the vegetables, I usually use shreds of carrots, Napa cabbages, and Chinese celery. 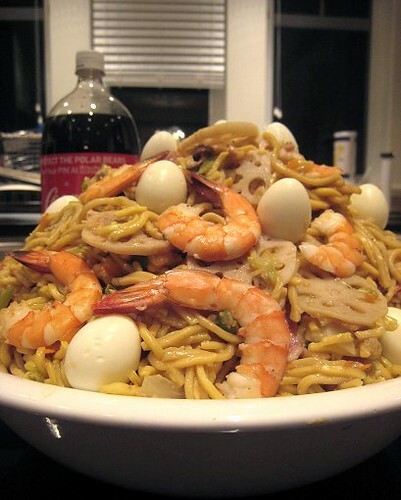 There really is no set recipe for pancit canton. I think of it like making fried rice. Here's a step-by-step look at one version we made. Recipe/Guide at end of post. 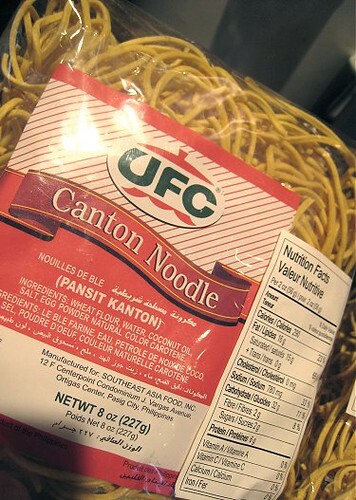 First of all, one needs canton noodles! These noodles need to blanched very briefly in boiling water to cook them. 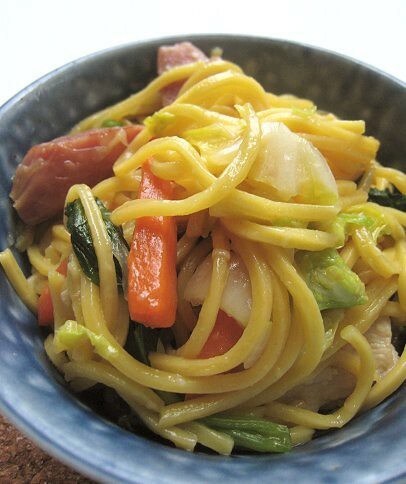 Alternatively, an even easier method is to buy cooked egg noodles (from the Asian supermarket) and use those instead. We've used both types of noodles. 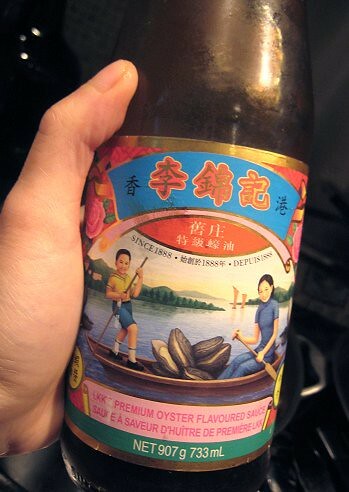 There's nothing like oyster sauce for that unmistakable "Chinese" flavor. I suppose one can just use soy sauce, but it's really not the same. 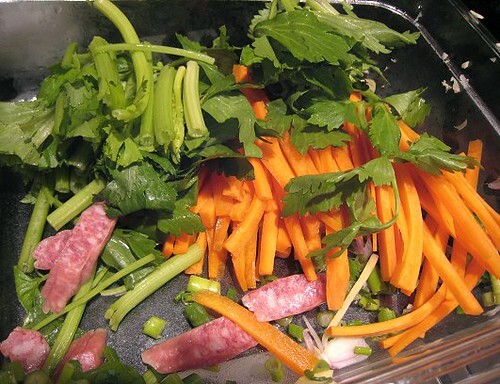 Chinese celery, Chinese sausage (lap cheong), carrots, green onions. Garlic, shallots and ginger have already vacated the container. Whenever we make pancit canton, JS is kind enough to do all the prep work for me, cutting up the vegetables, slicing chicken, etc. All I need to do is show up for the rock-star task of putting it all together. That above was a container filled with sliced shallots, green onions, garlic, and the tiniest amount of sliced ginger. I've already put those in the pan before realizing I should take a picture. 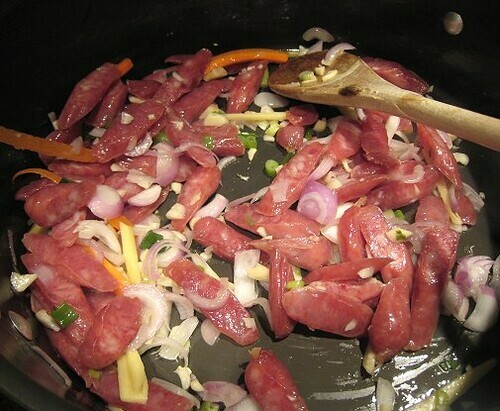 Also in there were carrots in strips, Chinese celery and Chinese sausage (lap cheong). Since the ingredients are ever-changing, I put them into the pan from the longest to cook, to the quickest to cook. But, always first to go in are the aromatics. 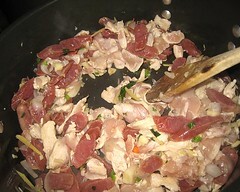 Into some hot oil went the sliced Chinese sausage, sliced garlic, sliced shallots and ginger. This time, we had chicken. I added them and stirred until they were 80% cooked through. The Chinese celery and the carrots went in next. See that pot there in the back? That's our stock. JS put some chicken carcasses in a pot, added water, and that was that. 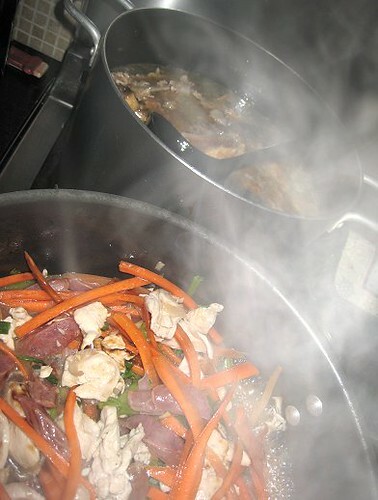 One can use any type of stock: chicken, beef, even shrimp stock or fish stock. I started ladling stock into our pancit canton pot. I usually stop at this point and just the let pot simmer on low while I concentrate on boiling the noodles. We would've set a pot of water to boil at the beginning of all this. The cooked egg noodles went in next. 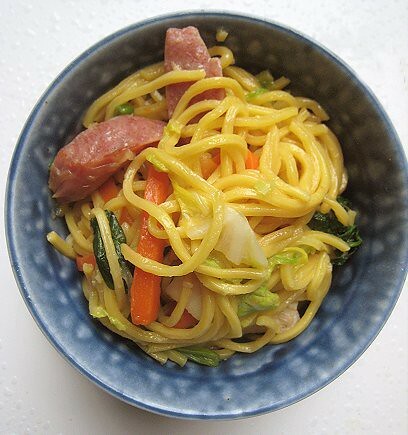 At this point, care is needed to mix up the ingredients in the pot, as one doesn't want the noodles in little broken pieces. Add oyster sauce to taste. Once can also add some soy sauce. On the bottom left is a big pot of pancit canton in the making. Next to it is a smaller pot, also of pancit canton in the making, because the big pot was not big enough for the quantity we were making. At the back is our big pot of chicken stock. 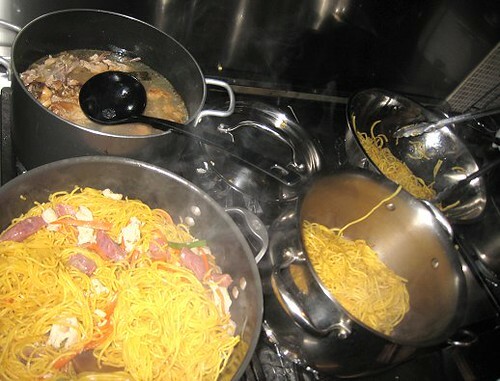 The bowl with the tongs contained the boiled/cooked noodles. 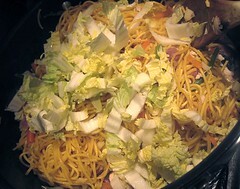 After the noodles and stock and the rest of the ingredients simmered for a bit, the shredded Napa cabbage went in. They don't take too long at cook at all. To finish the dish, I added green onions (and some stray Chinese sausage and Chinese celery leaves that I failed to add in the beginning) and made final adjustments of the seasoning. Pancit Canton is a real favorite of CSC's. The mere suggestion of making the dish sets her eyes a-twinkling. So, when we make it, we make a big batch. This version has shrimp, mushrooms, Chinese sausage, lotus root, and quail eggs (not hot pink, though). How big was this batch? That's a 2L Coke bottle beside it. 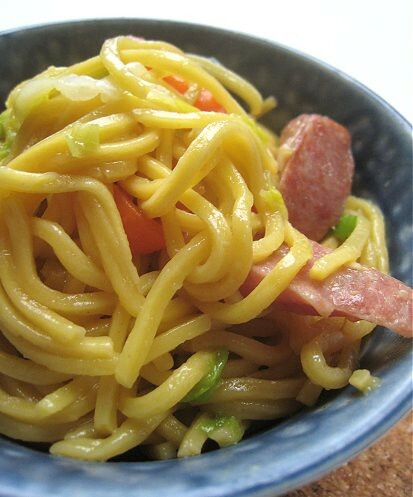 So, try making pancit canton and it could become your family's favorite. Please adjust the quantities to fit your requirement, much like making fried rice. 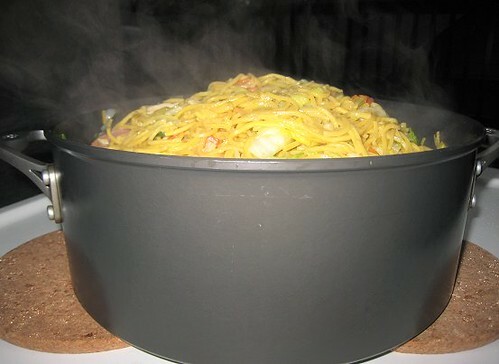 If using uncooked egg noodles, bring a large pot of water to boil. In the meantime, heat oil in another pot. Add garlic, onions and/or shallots, and ginger. Sauté until fragrant, about 30 seconds. 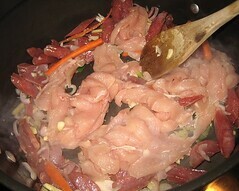 Add Chinese sausage and sliced raw meat. Cook until meat is about 80% cooked. 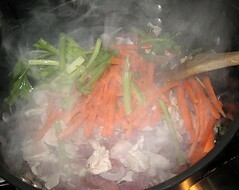 Add "longer-cooking" vegetables such as carrots, mushrooms, and Chinese celery. If using regular cabbage, add it now. Also add any uncooked seafood. Ladle stock into the pot. Simmer on low. If using uncooked noodles, add them to the pot of boiling water and cook until done (al dente). Drain. Add cooked egg noodles to the simmering pot. Season with oyster sauce and soy sauce. Add more stock if desired (the mixture should be just be slightly "wet" at this point). Add in any cooked seafood, the Napa cabbage and the quail eggs. Cook for about 5 to 10 minutes. Adjust seasoning (adding more salt, oyster sauce and/or soy sauce). Oh, yes. 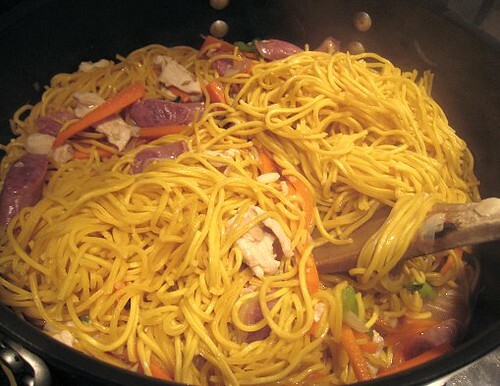 There is no such thing as too many leftover noodles...if indeed there are leftovers at all!! This looks delightful, just absolutely wonderful. Hey, do you know what makes the quail eggs hot pink? I've always wondered that, because things like beet root aren't really a widely used Asian ingredient. Ideas?? How can anyone resist this! Looks so good! 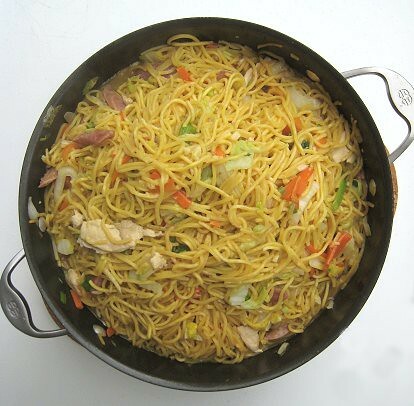 You always always have to make a big batch of pancit with hopes that there will be leftovers. But sadly that never happens. 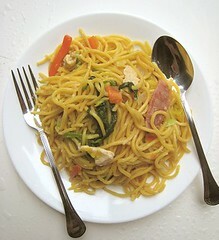 Your pancit canton looks so delicious, I think it's time for me to make some soon. I'm always afraid that we would be making too much... but in the end, it gets finished! happy to report that I made this last night as dinner for boyfriend and I. Talk about extremely tasty -- I used to not like pancit canton growing up (my family made it too salty) but this was just right! Even happy to learn that my Boston born-and bred boyfriend, who has only enjoyed two Filipino dishes thus far (adobo and arroz caldo) made the declaration of (a) this is the third pinoy dish he loves and (b) has requested that this appears at least once a month in our meal repertoire. So thank you for the recipe! Thumbing through the site's recipes for more dishes to stuff down his throat! We're glad to hear the recipe worked for you! =) Big smiles here.